Let's recap the starting pitchers whose skills surged the most after the All-Star Break in 2018. This exercise can help you identify emerging SP who could be undervalued in 2019 drafts. Let's take a closer look at some second half surgers worth targeting in your 2019 drafts. Matt Boyd (LHP, DET) has shown flashes of impact command over the past several seasons but hasn't been able to sustain them over long stretches. However, he was really good over the second half of 2018, both on the surface (3.88 ERA, 1.08 WHIP) but even more so beneath it: 9.0 Dom, 1.9 Ctl, 114 BPV. The key was his ability to increase his volume of strikes. There's some post-hype value here, especially given that you'll probably be able to get him for a buck. Carlos Carrasco (RHP, CLE) carries some sleeper Cy Young potential moving into 2019. After a skilled first half (140 BPV) that was obscured by a 4+ ERA, he put together elite results (2.33 ERA, 1.04 WHIP) and skills in the second half: 11.8 Dom, 1.7 Ctl, 53% GB%, 197 BPV. And with 30+ games started in three of the past four seasons, he's more durable than he often gets credit for. Lucas Giolito (RHP, CHW) was one of the worst SP in the game during the first half of 2018 (6.18 ERA, 1.51 WHIP), and that implosion wasn't a fluke (-25 BPV). While his results didn't get much better late in the season (6.04 ERA, 1.43 WHIP in 2H), his skills finally looked playable: 8.0 Dom, 3.9 Ctl, 51% GB%, 69 BPV. He improved all of his command sub-indicators too. Giolito will carry a high-risk/reward profile in 2019 drafts. Matt Harvey (RHP, LAA) will be avoided by owners who noticed his 5.37 ERA in the 2H of 2018, especially now that he's in the AL. But shrewd owners will note that his skills went from solid (94 BPV) to impactful: 8.8 Dom, 1.8 Ctl, 40% GB%, 126 BPV. You can't expect 200 IP from him, but a $5 bid could net $5 of profit. Blake Snell (LHP, TAM) carried many fantasy teams to titles in 2018. While his ace-like stats in the second half (1.17 ERA, 0.79 WHIP) were aided by a 25% H% and 91% S%, his skills went from good (108 BPV in 1H) to great: 12.7 Dom, 2.5 Ctl, 48% GB%, 188 BPV. He missed tons of bats late in the season too (18.5% SwK% in 2H). There's no reason to expect a significant pull-back here. Luis Castillo (RHP, CIN) is another young pitcher with rotation-anchor potential who started to fulfill that upside late in 2018. His skills blossomed in the second half: 9.4 Dom, 1.9 Ctl, 48% GB%, 143 BPV. His surface stats followed suit (2.44 ERA, 0.96 WHIP). He missed bats at a good rate (12.6% SwK%) while keeping the ball over the plate (33% ball%). A healthy Castillo could be on the verge of a breakout. Anthony DeSclafani (RHP, CIN) doesn't get the publicity of other SP mentioned in this space. That said, DeSclafani got healthy late in 2018 and improved more than you might realize. His skills after the All-Star Break were very strong: 9.3 Dom, 2.2 Ctl, 43% GB%, 130 BPV. He's another pitcher you'll probably be able to get on the cheap who could deliver a lot of profit in 2019. 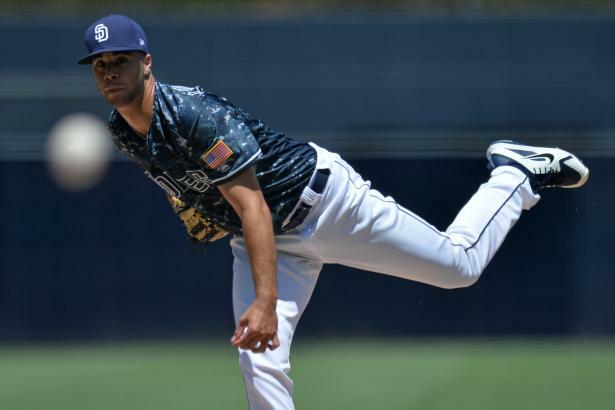 Joey Lucchesi (LHP, SD) went from an impactful SP early in 2018 (3.34 ERA, 1.22 WHIP in 1H) to mediocre late (4.88 ERA, 1.37 WHIP in 2H). Still, Lucchesi's skills soared in the second half: 10.9 Dom, 2.6 Ctl, 43% GB%, 147 BPV. His command sub-indicators all improved too (9.7% SwK%, 56% FpK%, 37% ball% in 1H; 11.7% SwK%, 62% FpK%, 35% ball% in 2H). This is another great place to look for profit. Trevor Richards (RHP, MIA) will be avoided in most leagues in 2019 due to the marginal stats he posted in 2018 (4.42 ERA, 1.39 WHIP), along with his lack of a prospect pedigree. Nonetheless, those in very deep leagues should tuck away the improvement he mustered in the second half (4.10 ERA, 1.23 WHIP, 110 BPV). He's worthy of your end-game attention if you play in a deep league. Zack Wheeler (RHP, NYM) ended 2018 on a roll, posting elite stats in the second half (1.68 ERA, 0.81 WHIP in 75 IP). Naysayers will point to his super-friendly 24% H%, 81% S%, and 5% hr/f. But his skills did grow quite a bit (92 BPV in 1H, 131 BPV in 2H). He still carries 3.00-ERA potential if he can stay healthy.